110 years ago, Frank Wiefels established the first funeral parlor in a vast region of desert and mountain wilderness of the Wild West. Frank Joseph Wiefels, born in Krefeld Germany in 1860. He migrated to Grand Rapids, Michigan (then the U.S furniture capital of the time) in the 1880's to continue his cabinet and upholstery business. There he met Francis Dawson, and they were married. At the time, the furniture and funeral business were very intertwined, as many furniture companies made caskets, and Frank decided to attend embalming school in Memphis in the 1890's. From there he moved on to California. Frank and Francis first moved to Stockton and there, their only son Harold Francis Wiefels was born in 1898, the same year Frank served in the Spanish-American War. Later, in 1907, Frank moved the family to Banning, a noted TB treatment location with the hopes of helping his ailing wife. There he opened a furniture store on South San Gorgonio Street. At the turn of the century, Banning was a small but growing farming community without anyone to provide the needed care and facilities when a death occurred. Frank saw an opportunity with his experience and schooling and opened the Banning Undertaking Company in 1908. From there the Wiefels family business began, now spanning five generations and still prominent in the San Gorgonio Pass and desert communities. Frank had a huge, untamed territory to cover from the High Desert down to the Coachella and west toward Riverside and Redlands Valley. He was often called upon in the middle of the night to ride his buggy out, filled with gear, a laying-out board and gravity bottles for embalming, to Palm Springs, 29 Palms, Indio or even as far as the Salton Sea. Preparation of the deceased was done in the family's home, often just a shack lit by lanterns and with no running water. Once a body was prepared for burial, the next step was often shipping the casket home to Nebraska, Illinois or New York as few people who came to the area lived there full time, many came to recuperate from illnesses. Frank was known as quite a legendary "character", racing cars, trapping mountain lions and owning an extensive gun collection. One time, it was said, he shot out the telephone lines in Banning and the town had no phone service for days! One time Frank was transporting remains to Anaheim, when a vehicle collided with his coach causing an explosion. Frank jumped from the burning vehicle and despite his injuries, rushed into the flames to rescue the corpse from the baggage compartment. Most people would have to wonder about saving a dead person, but Frank was committed to his business. The present Banning location at the corner of San Gorgonio and Nicolet Streets in Banning was selected in 1914, offering a chapel, slumber rooms, casket selection rooms and offices. From this location the ambulance service was provided with the nearest hospitals being Riverside and San Bernadino. 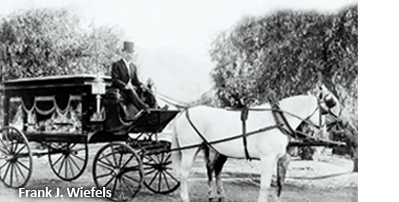 About 1915, Harold F. Wiefels was taken into the business and the name changed to Wiefels & Son Funeral Directors. Frank and Harold worked together until Harold and his wife, Mary Thompson Wiefels, bought the business in 1928. 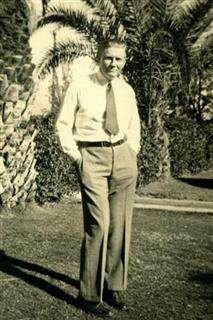 Harold Wiefels grew up in Banning and graduated from Banning High School. He served in WWI and then married Mary Thompson Wiefels in 1921. Mary was born in South Bend, Washington September 17, 1902 and her family moved to Beaumont in 1906. She graduated from Beaumont High School and was working as a telephone operator when she met Harold. They had two sons, Howard, born in 1922 and Frank, born in 1925, and lived across the street from the mortuary on Murray Street. Harold and Mary ran the business with the same dignity and thoughtfulness that the community had grown to expect from Wiefels & Son. They completed a major renovation of the building in 1930. Harold's death in 1934 left Mary to continue the family business with the assistance of her brother Bert Thompson. The death of Bert in 1945 left Mary with little help in running the business. Her son Howard, just home from WWII, with plans of continuing at UCLA and becoming a lawyer were changed, and instead he attended embalming school and took over the family business. Howard's Mother continued to work at the funeral home and was a vital part of the business from 1934-1947. She remarried in 1948 and became Mary Wiefels Stockton and continued to live in Banning until she passed in 1998. Frank, Howard's brother, attended college and became a medical doctor specializing in Radiology and resided in San Jose until his death in 2001. 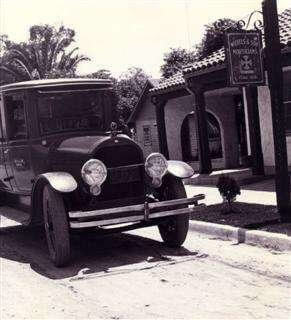 In 1948, Howard saw the need for mortuary and ambulance services in the desert area, moved to Palm Springs and opened the Vella Road location. In the next couple years, additional locations in 29 Palms and Yucca Valley were added covering the entire desert and pass areas. In the 1950's, Howard remodeled the Banning location adding the arrangement room, a parking lot and a beautiful water fountain. Howard married Diana Jane Sullivan and had two children, Michael Joseph, born in 1963 and Lori Ann, born in 1967. Howard and Diana were both extremely active in the community, amongst other things, Howard as the Mayor of Palm Springs and Chairman of the Board of Directors for Desert Hospital and Diana as a volunteer for the Maternity Ward of Desert Hospital. In 1980, a fire started by neighborhood children resulted in the required demolition of the Banning location garage, preparation room, office areas in addition to the old Wiefels residence. Business was conducted out of a trailer for a year until the project was completed resulting in a modern facility that has maintained the traditional "Stagecoach Town" appearance and met the needs of the ever changing and growing community. 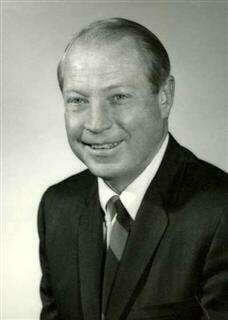 Howard passed away in 2006, at the home he and Diana shared for 42 years in The Mesa section of Palm Springs. Diana still resides in the family home and remains active in the community, helps with services at the Palm Springs mortuary and enjoys time with her grandchildren.